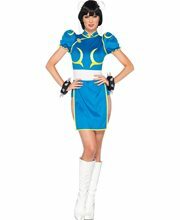 Street Fighter Chun Li Adult Costume.Includes: Dress, collar, braid covers, belt, and spike braceletsAvailable Size: Womens - Small (4-6), Womens - Medium (8-10), Womens - Large (12-14). (See Size Chart For More Information)*Fishnets and Boots Not Included.The First Lady of Fighting Games, Chun Li is an Interpol agent, a fiercely competitive fighter in the Street Fighter game series, and a role model for women's empowerment! Show off that strength with this Adult Chun Li Costume! With this silky blue cut off dress, white waist belt, white hair accessories and the familiar black spike wrist bracelets, you'll be ready to take charge this Halloween! 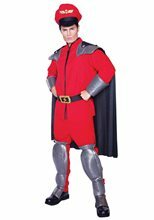 Planning on going as a group? 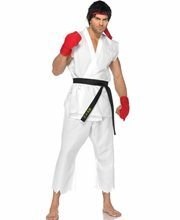 Stay in the Street Fighter spirit and group your Adult Chun Li Costume with our other Ken and Ryu Street Fighter costumes! 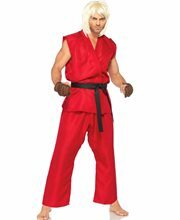 Street Fighter Akuma Adult Costume.Includes: Pants, shirt, belt, gloves, and necklace.Available Size: Mens - Small (38-40), Mens - Medium (42-44), Mens - Large (46-48). 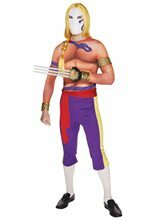 *Wig Not Included.Care Instructions: Hand Wash Cold Separately, No Bleach, Line Dry. 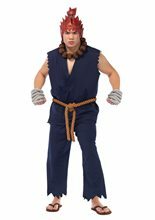 Do not Iron or Dry Clean.Ignite the flames of glory ...The Street Fighter – Akuma Adult Costume includes A blue worn shirt with an open chest, a pair of blue tethered pants, a brown belt and brown gloves.